This article is more than 5 years old. Please read this page keeping its age in mind. Carey Bloomer, left, and Baroness Tanni Grey-Thompson. Carey Bloomer, of the Uplands at Oxon nursing home in Shrewsbury, beat off stiff competition to win the Registered Manager of the Year award at a glittering, 1920s-themed ceremony at the Lord Hill Hotel. 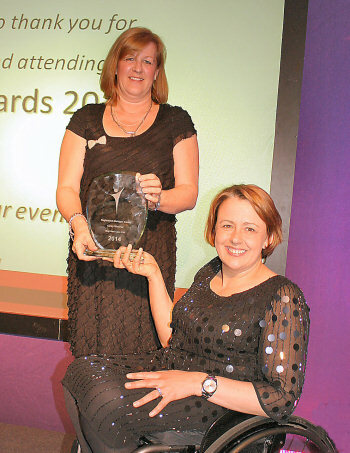 She was presented with the award by Paralympics legend and guest speaker at the event, Baroness Tanni Grey-Thompson. Mandy Thorn, the managing director of the Uplands, said: “Everyone here is absolutely delighted for Carey. “She is quite simply an exceptional nurse and manager, and held in the very highest respect by staff, residents, their families and GPs. “Carey’s commitment to ensuring that residents at the Uplands receive the best possible care is exemplary and since she became our registered manager she has transformed our organisation through her leadership and sense of purpose. Mrs Bloomer, who oversees a workforce of 150 nurses, carers and other staff, said winning the award was a “huge surprise”. She added: “I was astonished that I even made the shortlist, so to win was a huge surprise to put it mildly. “Of course I am extremely pleased to win, but I feel much of the credit for the award must go to the fantastic team of staff at the Uplands who are exceptionally dedicated to achieving best practice. The Uplands provides accommodation for 81 people requiring nursing and care and includes two units dedicated to caring for those suffering from dementia-related illnesses. It is run by its umbrella company, Marches Care, which also operates the Uplands Day Resource Centre on the same site.